I’m writing to you, as I do only twice a year, to invite your financial support for this important work. This year is literally pivotal. That’s because after a year-and-a-half of transitioning to a new production team, it’s finally about to happen! We are in serious conversation with a new group of young (well, younger than me, anyway), energetic, activist-oriented people connected to radical faith communities. Watch for an announcement early next year. But, as we approach year-end, we still need $8,000 to meet our budget, pay writers, cover rent, keep internet connected, and pay for postage. This award-winning, ad-free magazine operates on a very tight budget, with pre-owned machinery, many volunteers, and modest pay for part-time workers. 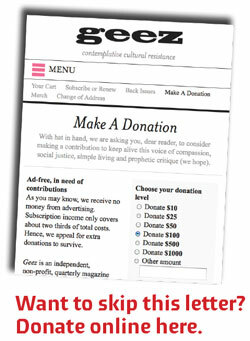 As you know, we are almost entirely reader-supported – we receive no income from advertising and receive only the occasional small publishing grant for special projects (for example, watch for the “poetics of resistance” issue coming soon, courtesy of the Manitoba Arts Council).